Launchpad serves as a quick way to open applications on the Mac from a familiar iOS-like icon grid interface. If you’ve customized the way these app icons and arranged in Launchpad, you may decide you’d like to start from scratch and reset their order to how things appear when you first get a Mac. This can also be helpful if you want to rearrange the way Launchpad icons show up, but it can also be helpful to resolve some display bugs with Launchpad, particularly if an icon doesn’t show up or is displaying incorrectly. In prior versions of OS X, users were able to refresh Launchpad contents by dumping a handful of database files, but in Mac OS and OS X 10.10.x onward, you’ll need to use a defaults command string to reset Launchpad contents and layout instead. When you open Launchpad again, the layout will have returned to the default, placing all bundled apps onto the first screen of Launchpad, and third party apps onto the secondary (and third, if applicable) screens. You can now rearrange the icons and layout of Launchpad as you see fit, or just keep the default layout of Apple apps on the first screen, with third party apps and additions on the later screens. 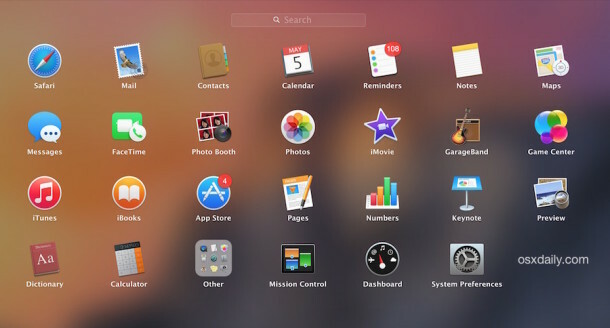 This defaults command string was found on stackexchange, though the user who mentioned it still listed the old database dumping trick as a necessary step – in testing, that latter Launchpad database removal command is not necessary to simply reset the Launchpad layout in OS X Yosemite 10.10.x +. Thank you for this god tip. Is there an automated way to alphasort apps in Launchpad? I copied and pasted and all OK.
COOOOOL! It really worked well. The Intaglio icon was grayed out in Launch Pad and showing a partial download after updating at the App Store and nothing worked. This recommendation did. Thanks! I only use Launchpad a few times (accidentally) right after getting a new Mac, until I remember to turn it off. Opening a program with Alfred or Spotlight is so much faster. Am I missing something? I can edit the profile and enter the string as a command but it doesn’t work whereas I can paste the command to a command line and it works fine. Ah – I found a way! I set it to login shell and entered the command as ‘Send Text at Start’ whereas I was getting the error when I set it to login command and entering the command as the text if that even makes sense! Thanks, that came in handy! Just out of curiosity, is there a way to fit all of the Launchpad icons onto one screen? Unfortunately, doesn’t work in Sierra. thxs man, very helpful !! This was working for me since even before Yosemite but since the latest update (High Sierra) it rearrange the application in a really weird order, does anybody have the same result ? This no longer works with High Sierra which is extremely frustrating. Any idea what the solution might be? Wow! Worked like magic! Thank you so much! Works on MacOS Mojave. Thank you. I tried doing this while I was installing an app and it broke; but after it finished, the command worked as expected.